WELCOME to the Christian Gun Owner web site. There is a huge American community of Christians who know that this country was founded on the principles of the Bible and under the guiding hand of an almighty God. That community believes that the U.S. Constitution and the Bill of Rights were a result of that guidance. Christians often send notes to me stating that they're glad to find out that they're not alone. It's amazing to me, as many contacts as I have through this site, that Christians who own guns and enjoy the shooting sports feel as isolated as they do. The fact is that millions of responsible Christians across the U.S. enjoy shooting and hunting. And millions believe in the right and responsibility to protect themselves and their families from criminal assault. This site is dedicated to those millions of Christians. The patriots who enjoy the shooting sports of all kinds and believe in and practice responsibility for their and their family's safety and protection. A ten year old learning to shoot a Walther P22 under the watchful eye of my wife. This is a site with an owner that understands that firearms use is not consigned to criminals, and not destined to accidents. 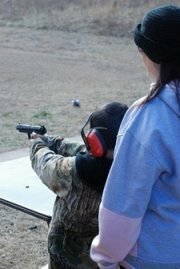 We've taught countless kids how to handle firearms safely while becoming proficient shooters. 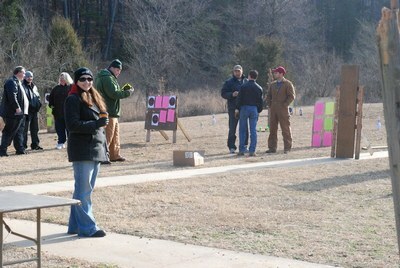 Part of that includes the responsibility to teach them to regard firearms with respect. It means serious believers in Christ. Believers that live their lives in a way that is evidence of their faith. Nothing more or less. The real kind of Christian, not the tv kind. Just believers in Christ that express that belief by living their everyday lives attempting to do their best to follow Christ. But they also acknowledge their human nature and occasional failures. The true Christian gun owner believes he/she is to be a servant to humanity. But that belief does but not extend to being a doormat to those who refuse to live by the rules of reasonable human behavior. So .... what if you're a gun owner, but not a Christian? That question arises from time to time when people contact me wanting to ask a question about guns. Some apparently feel they have to "confess" they're not believers. So here's the clear answer. You're as welcome here as any gun owner, Christian or other. That said, if you found this site and take issue with fundamental Christian beliefs, this is not a place for you to vent. If you would like to enter here to view, read, consider, learn, and communicate, please make yourself at home. And please feel free to contribute to the information. Your and my beliefs or lack of them does not have to become a contentious issue in our discussion of guns, America, politics and rights. In the process of deciding on gun ownership? Finally, if you're just looking into gun ownership, this is a great place to look around and learn. Feel free to contact me with your questions, using the link in the right sidebar. Now .... Let's get started. Armed Church Security Guide, giving church leaders from across the country perspective on what it will take to transition to armed security for their facilities. Learning To Move And Shoot rather than only practicing shooting while in a static stance. Can mean the difference between life and death in a live encounter. When Your Family Is Ready For Handgun Shooting Readiness: You can't force your spouse or kids to want to shoot. But when they show an interest, don't delay helping them get started. Women Overcoming Handgun Recoil You can handle, shoot, conceal and carry most consumer-available handguns without fearing recoil.